For other uses, see Parsec (disambiguation). A unit of length refers to any discrete, pre-established length or distance having a constant magnitude which is used as a reference or convention to express linear dimension. The most common units in modern use are U.S. customary units in the United States and metric units elsewhere. British Imperial units are still used for some purposes in the United Kingdom and some other countries. The metric system is sub-divided into SI and non-SI units. An astronomical object or celestial object is a naturally occurring physical entity, association, or structures that exists in the observable universe. In astronomy, the terms object and body are often used interchangeably. However, an astronomical body or celestial body is a single, tightly bound, contiguous entity, while an astronomical or celestial object is a complex, less cohesively bound structure, which may consist of multiple bodies or even other objects with substructures. The parsec unit was probably first suggested in 1913 by the British astronomer Herbert Hall Turner. Named as a portmanteau of the parallax of one arcsecond, it was defined to make calculations of astronomical distances from only their raw observational data quick and easy for astronomers. Partly for this reason, it is the unit preferred in astronomy and astrophysics, though the light-year remains prominent in popular science texts and common usage. Although parsecs are used for the shorter distances within the Milky Way, multiples of parsecs are required for the larger scales in the universe, including kilo parsecs (kpc) for the more distant objects within and around the Milky Way, mega parsecs (Mpc) for mid-distance galaxies, and giga parsecs (Gpc) for many quasars and the most distant galaxies. An astronomer is a scientist in the field of astronomy who focuses their studies on a specific question or field outside the scope of Earth. They observe astronomical objects such as stars, planets, moons, comets, and galaxies – in either observational or theoretical astronomy. Examples of topics or fields astronomers study include planetary science, solar astronomy, the origin or evolution of stars, or the formation of galaxies. Related but distinct subjects like physical cosmology, which studies the Universe as a whole. Herbert Hall Turner FRS was a British astronomer and seismologist. The parsec is defined as being equal to the length of the longer leg of an extremely elongated imaginary right triangle in space. The two dimensions on which this triangle is based are its shorter leg, of length one astronomical unit (the average Earth-Sun distance), and the subtended angle of the vertex opposite that leg, measuring one arc second. Applying the rules of trigonometry to these two values, the unit length of the other leg of the triangle (the parsec) can be derived. A right triangle or right-angled triangle is a triangle in which one angle is a right angle. The relation between the sides and angles of a right triangle is the basis for trigonometry. A star is type of astronomical object consisting of a luminous spheroid of plasma held together by its own gravity. The nearest star to Earth is the Sun. Many other stars are visible to the naked eye from Earth during the night, appearing as a multitude of fixed luminous points in the sky due to their immense distance from Earth. Historically, the most prominent stars were grouped into constellations and asterisms, the brightest of which gained proper names. 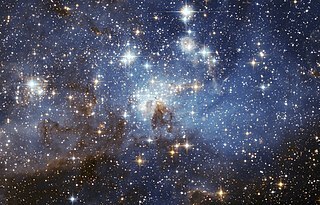 Astronomers have assembled star catalogues that identify the known stars and provide standardized stellar designations. However, most of the estimated 300 sextillion (3×1023) stars in the Universe are invisible to the naked eye from Earth, including all stars outside our galaxy, the Milky Way. 61 Cygni is a binary star system in the constellation Cygnus, consisting of a pair of K-type dwarf stars that orbit each other in a period of about 659 years. Of apparent magnitude 5.20 and 6.05, respectively, they can be seen with binoculars in city skies or with the naked eye in rural areas without photopollution. The parallax of a star is defined as half of the angular distance that a star appears to move relative to the celestial sphere as Earth orbits the Sun. Equivalently, it is the subtended angle, from that star's perspective, of the semimajor axis of the Earth's orbit. The star, the Sun and the Earth form the corners of an imaginary right triangle in space: the right angle is the corner at the Sun, and the corner at the star is the parallax angle. The length of the opposite side to the parallax angle is the distance from the Earth to the Sun (defined as one astronomical unit (au), and the length of the adjacent side gives the distance from the sun to the star. Therefore, given a measurement of the parallax angle, along with the rules of trigonometry, the distance from the Sun to the star can be found. A parsec is defined as the length of the side adjacent to the vertex occupied by a star whose parallax angle is one arcsecond. In mathematics and all natural sciences, the angular distance between two point objects, as viewed from a location different from either of these objects, is the angle of length between the two directions originating from the observer and pointing toward these two objects. Trigonometry is a branch of mathematics that studies relationships between side lengths and angles of triangles. The field emerged in the Hellenistic world during the 3rd century BC from applications of geometry to astronomical studies. In particular, 3rd-century astronomers first noted that the ratio of the lengths of two sides of a right-angled triangle depends only of one acute angles of the triangle. These dependencies are now called trigonometric functions. The use of the parsec as a unit of distance follows naturally from Bessel's method, because the distance in parsecs can be computed simply as the reciprocal of the parallax angle in arcseconds (i.e. if the parallax angle is 1 arcsecond, the object is 1 pc from the Sun; if the parallax angle is 0.5 arcseconds, the object is 2 pc away; etc.). No trigonometric functions are required in this relationship because the very small angles involved mean that the approximate solution of the skinny triangle can be applied. Though it may have been used before, the term parsec was first mentioned in an astronomical publication in 1913. Astronomer Royal Frank Watson Dyson expressed his concern for the need of a name for that unit of distance. He proposed the name astron, but mentioned that Carl Charlier had suggested siriometer and Herbert Hall Turner had proposed parsec. It was Turner's proposal that stuck. A corollary states that a parsec is also the distance from which a disc one astronomical unit in diameter must be viewed for it to have an angular diameter of one arcsecond (by placing the observer at D and a diameter of the disc on ES). where θ is the measured angle in arcseconds, Distanceearth-sun is a constant (1 AU or 1.5813×10−5 ly). The calculated stellar distance will be in the same measurement unit as used in Distanceearth-sun (e.g. if Distanceearth-sun = 1 AU, unit for Distancestar is in astronomical units; if Distanceearth-sun = 1.5813×10−5 ly, unit for Distancestar is in light years). The length of the parsec used in IAU 2015 Resolution B2  (exactly 7005648000000000000♠648000/π astronomical units) corresponds exactly to that derived using the small-angle calculation. This differs from the classic inverse-tangent definition by about 200 km, i.e. only after the 11th significant figure. As the astronomical unit was defined by the IAU (2012) as an exact SI length in metres, so now the parsec corresponds to an exact SI length in metres. To the nearest meter, the small-angle parsec corresponds to 30,856,775,814,913,673 m.
One astronomical unit (au), the distance from the Sun to the Earth, is just under 6994499999999999999♠5×10−6 parsecs. The most distant space probe, Voyager 1 , was 6996703000000000000♠0.000703 parsecs from Earth as of January 2019 [update] . Voyager 1 took 41 years to cover that distance. One parsec is approximately 3.26 light-years. Proxima Centauri, the nearest known star to earth other than the sun, is about 1.30 parsecs (4.24 light-years) away, by direct parallax measurement. The distance to the open cluster Pleiades is 7018401138085590734♠130±10 pc (7018397350679848393♠420±30 ly) from us, per Hipparcos parallax measurement. The centre of the Milky Way is more than 8 kiloparsecs (7020245978992287100♠26000 ly) from the Earth, and the Milky Way is roughly 34 kpc (7021104068035198388♠110000 ly) across. The Andromeda Galaxy (M31) is about 780 kpc (2.5 million light-years) away from the Earth. A distance of one million parsecs is commonly denoted by the megaparsec (Mpc). Astronomers typically express the distances between neighbouring galaxies and galaxy clusters in megaparsecs. One gigaparsec (Gpc) is one billion parsecs — one of the largest units of length commonly used. One gigaparsec is about 3.26 billion light-years, or roughly 1/14 of the distance to the horizon of the observable universe (dictated by the cosmic background radiation). Astronomers typically use gigaparsecs to express the sizes of large-scale structures such as the size of, and distance to, the CfA2 Great Wall; the distances between galaxy clusters; and the distance to quasars. The Andromeda Galaxy is about 0.78 Mpc (2.5 million light-years) from the Earth. The galaxy RXJ1242-11, observed to have a supermassive black hole core similar to the Milky Way's, is about 200 Mpc (650 million light-years) from the Earth. The galaxy filament Hercules–Corona Borealis Great Wall, currently the largest known structure in the universe, is about 3 Gpc (10 billion light-years) across. In physical cosmology, volumes of cubic gigaparsecs [lower-alpha 2] (Gpc3) are selected to determine the distribution of matter in the visible universe and to determine the number of galaxies and quasars. The Sun is the only star in its cubic parsec, [lower-alpha 2] (pc3) but in globular clusters the stellar density could be from 100 to 1000 per cubic parsec. ↑ One trillion here is taken to be 1012 (one million million, or billion in long scale). The astronomical unit is a unit of length, roughly the distance from Earth to the Sun. However, that distance varies as Earth orbits the Sun, from a maximum (aphelion) to a minimum (perihelion) and back again once a year. Originally conceived as the average of Earth's aphelion and perihelion, since 2012 it has been defined as exactly 149597870700 metres or about 150 million kilometres. The astronomical unit is used primarily for measuring distances within the Solar System or around other stars. It is also a fundamental component in the definition of another unit of astronomical length, the parsec. Absolute magnitude is a measure of the luminosity of a celestial object, on a logarithmic astronomical magnitude scale. An object's absolute magnitude is defined to be equal to the apparent magnitude that the object would have if it were viewed from a distance of exactly 10 parsecs, with no extinction of its light due to absorption by interstellar dust particles. By hypothetically placing all objects at a standard reference distance from the observer, their luminosities can be directly compared on a magnitude scale. As with all astronomical magnitudes, the absolute magnitude can be specified for different wavelength ranges corresponding to specified filter bands or passbands; for stars a commonly quoted absolute magnitude is the absolute visual magnitude, which uses the visual (V) band of the spectrum. Absolute magnitudes are denoted by a capital M, with a subscript representing the filter band used for measurement, such as MV for absolute magnitude in the V band. Parallax is a displacement or difference in the apparent position of an object viewed along two different lines of sight, and is measured by the angle or semi-angle of inclination between those two lines. Due to foreshortening, nearby objects show a larger parallax than farther objects when observed from different positions, so parallax can be used to determine distances. 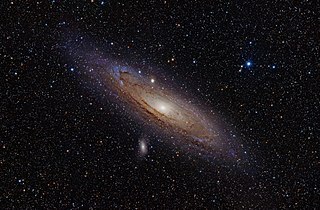 The Andromeda Galaxy, also known as Messier 31, M31, or NGC 224, is a spiral galaxy approximately 780 kiloparsecs from Earth, and the nearest major galaxy to the Milky Way. Its name stems from the area of the Earth's sky in which it appears, the constellation of Andromeda. Stellar parallax is the apparent shift of position of any nearby star against the background of distant objects. Created by the different orbital positions of Earth, the extremely small observed shift is largest at time intervals of about six months, when Earth arrives at exactly opposite sides of the Sun in its orbit, giving a baseline distance of about two astronomical units between observations. The parallax itself is considered to be half of this maximum, about equivalent to the observational shift that would occur due to the different positions of Earth and the Sun, a baseline of one astronomical unit (AU). A microquasar, the smaller version of a quasar, is a compact region surrounding a black hole with a mass several times that of our sun, and its companion star. The matter being pulled from the companion star forms an accretion disk around the black hole. This accretion disk may become so hot, due to friction, that it begins to emit X-rays. The disk also projects narrow streams or "jets" of subatomic particles at near-light speed, generating a strong radio wave emission. 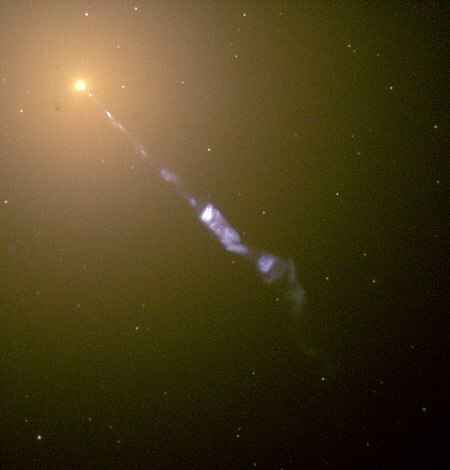 Messier 87 is a supergiant elliptical galaxy in the constellation Virgo. One of the most massive galaxies in the local Universe, it has a large population of globular clusters—about 12,000 compared with the 150–200 orbiting the Milky Way—and a jet of energetic plasma that originates at the core and extends at least 1,500 parsecs, traveling at relativistic speed. It is one of the brightest radio sources in the sky and a popular target for both amateur and professional astronomers. The Space Interferometry Mission, or SIM, also known as SIM Lite, was a planned space telescope proposed by the U.S. National Aeronautics and Space Administration (NASA), in conjunction with contractor Northrop Grumman. One of the main goals of the mission was the hunt for Earth-sized planets orbiting in the habitable zones of nearby stars other than the Sun. SIM was postponed several times and finally cancelled in 2010. In addition to detecting extrasolar planets, SIM would have helped astronomers construct a map of the Milky Way galaxy. Other important tasks would have included collecting data to help pinpoint stellar masses for specific types of stars, assisting in the determination of the spatial distribution of dark matter in the Milky Way and in the local group of galaxies and using the gravitational microlensing effect to measure the mass of stars. 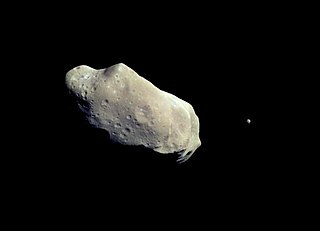 The spacecraft would have used optical interferometry to accomplish these and other scientific goals. The angular diameter, angular size, apparent diameter, or apparent size is an angular measurement describing how large a sphere or circle appears from a given point of view. In the vision sciences, it is called the visual angle, and in optics, it is the angular aperture. The angular diameter can alternatively be thought of as the angle through which an eye or camera must rotate to look from one side of an apparent circle to the opposite side. Angular radius equals half the angular diameter. 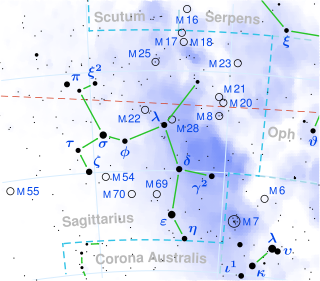 Eta Sagittarii is a binary star system in the southern zodiac constellation of Sagittarius. Based upon parallax measurements, it is located at a distance of 146 light-years from Earth. It was formerly known as Beta Telescopii (β Tel). In India, where part of the constellation of Sagittarius represents an Elephant, this star forms the creature's tail. The Virgo Stellar Stream, also known as Virgo Overdensity, is the proposed name for a stellar stream in the constellation of Virgo which was discovered in 2005. The stream is thought to be the remains of a dwarf spheroidal galaxy that is in the process of merging with the Milky Way. It is the largest galaxy visible from the Earth, in terms of the area of the night sky covered. In astrometry, the moving-cluster method and the closely related convergent point method are means, primarily of historical interest, for determining the distance to star clusters. They were used on several nearby clusters in the first half of the 1900s to determine distance. The moving-cluster method is now largely superseded by other, usually more accurate distance measures. The Dark Energy Survey (DES) is a visible and near-infrared survey that aims to probe the dynamics of the expansion of the Universe and the growth of large-scale structure. The collaboration is composed of research institutions and universities from the United States, Brazil, the United Kingdom, Germany, Spain, and Switzerland. Knowledge of the location of Earth has been shaped by 400 years of telescopic observations, and has expanded radically in the last century. Initially, Earth was believed to be the center of the Universe, which consisted only of those planets visible with the naked eye and an outlying sphere of fixed stars. After the acceptance of the heliocentric model in the 17th century, observations by William Herschel and others showed that the Sun lay within a vast, disc-shaped galaxy of stars. By the 20th century, observations of spiral nebulae revealed that our galaxy was one of billions in an expanding universe, grouped into clusters and superclusters. By the end of the 20th century, the overall structure of the visible universe was becoming clearer, with superclusters forming into a vast web of filaments and voids. Superclusters, filaments and voids are the largest coherent structures in the Universe that we can observe. At still larger scales the Universe becomes homogeneous meaning that all its parts have on average the same density, composition and structure. A skinny triangle in trigonometry is a triangle whose height is much greater than its base. The solution of such triangles can be greatly simplified by using the approximation that the sine of a small angle is equal to the angle in radians. The solution is particularly simple for skinny triangles that are also isosceles or right triangles: in these cases the need for trigonometric functions or tables can be entirely dispensed with. Bedin I is a dwarf spheroidal galaxy located in the constellation Pavo. It is situated behind the globular cluster NGC 6752, though is around 28.38 million light-years from Earth. Bedin I is one of the oldest galaxies known, having formed around 10–13 billion years ago, and is one of the most isolated dwarf galaxies known, situated around 2.12 million light-years away from NGC 6744, its nearest neighbor with which it may be physically associated. As such, it has been deemed by astronomers as a "fossil" from the early universe. It was accidentally discovered by Italian astronomer Luigi Bedin, whose team was studying white dwarfs in NGC 6752 using the Hubble Space Telescope in September 2018; the discovery was announced in a paper published in January 2019. Donatiello I, also known as Mirach's Goblin, is a dwarf spheroidal galaxy located in the constellation Andromeda, located between 8.1 and 11.4 million light-years from Earth. It is a possible satellite galaxy of the dwarf lenticular galaxy NGC 404, "Mirach's Ghost", which is located 60 arcminutes away. It is otherwise one of the most isolated dwarf spheroidal galaxies known, being physically located around 211,000 light-years away from NGC 404. The galaxy is named after its discoverer, amateur astrophotographer Giuseppe Donatiello, who sighted the galaxy in a 2016 review of his archival long exposures from 2010 and 2013. Follow-up observations with the Roque de los Muchachos Observatory led to a scientific paper on its discovery being published in December 2018. ↑ "Cosmic Distance Scales - The Milky Way" . Retrieved 24 September 2014. ↑ Benedict, G. F.; et al. "Astrometric Stability and Precision of Fine Guidance Sensor #3: The Parallax and Proper Motion of Proxima Centauri" (PDF). Proceedings of the HST Calibration Workshop. pp. 380–384. Retrieved 11 July 2007. 1 2 Dyson, F. W. (March 1913). "Stars, Distribution and drift of, The distribution in space of the stars in Carrington's Circumpolar Catalogue". Monthly Notices of the Royal Astronomical Society . 73 (5): 334–342. Bibcode:1913MNRAS..73..334D. doi:10.1093/mnras/73.5.334. There is a need for a name for this unit of distance. Mr. Charlier has suggested Siriometer ... Professor Turner suggests parsec, which may be taken as an abbreviated form of 'a distance corresponding to a parallax of one second'. Cox, Arthur N., ed. (2000). Allen's Astrophysical Quantities (4th ed.). New York: AIP Press / Springer. Bibcode:2000asqu.book.....C. ISBN 978-0387987460. Binney, James; Tremaine, Scott (2008). Galactic Dynamics (2nd ed.). Princeton, NJ: Princeton University Press. Bibcode:2008gady.book.....B. ISBN 978-0-691-13026-2. ↑ High Energy Astrophysics Science Archive Research Center (HEASARC). "Deriving the Parallax Formula". NASA's Imagine the Universe!. Astrophysics Science Division (ASD) at NASA's Goddard Space Flight Center . Retrieved 26 November 2011. ↑ Bessel, F. W. (1838). "Bestimmung der Entfernung des 61sten Sterns des Schwans" [Determination of the distance of the 61st star of Cygnus]. Astronomische Nachrichten . 16 (5): 65–96. Bibcode:1838AN.....16...65B. doi:10.1002/asna.18390160502. Archived from the original on 2007-06-24. ↑ "Four Resolutions to be Presented for Voting at the IAU XXIX GA". ↑ Pogge, Richard. "Astronomy 162". Ohio State University. "The Hipparcos Space Astrometry Mission" . Retrieved 28 August 2007. Turon, Catherine. "From Hipparchus to Hipparcos". ↑ "GAIA". European Space Agency. ↑ "Galaxy structures: the large scale structure of the nearby universe". Archived from the original on 5 March 2007. Retrieved 22 May 2007. ↑ Mei, S.; Blakeslee, J. P.; Côté, P.; et al. (2007). "The ACS Virgo Cluster Survey. XIII. SBF Distance Catalog and the Three-dimensional Structure of the Virgo Cluster". The Astrophysical Journal. 655 (1): 144–162. arXiv: astro-ph/0702510 . Bibcode:2007ApJ...655..144M. doi:10.1086/509598. ↑ Lineweaver, Charles H.; Davis, Tamara M. (2005-03-01). "Misconceptions about the Big Bang". Scientific American. 292 (3): 36–45. Bibcode:2005SciAm.292c..36L. doi:10.1038/scientificamerican0305-36. Archived from the original on 2011-08-10. Retrieved 2016-02-04. ↑ Kirshner, R. P.; Oemler, A., Jr.; Schechter, P. L.; Shectman, S. A. (1981). "A million cubic megaparsec void in Bootes". The Astrophysical Journal. 248: L57. Bibcode:1981ApJ...248L..57K. doi:10.1086/183623. ISSN 0004-637X. ↑ "'Solo' Corrected One of the Most Infamous 'Star Wars' Plot Holes". 2018-05-30. Guidry, Michael. "Astronomical Distance Scales". Astronomy 162: Stars, Galaxies, and Cosmology. University of Tennessee, Knoxville. Archived from the original on 12 December 2012. Retrieved 26 March 2010. Merrifield, Michael. "pc Parsec". Sixty Symbols. Brady Haran for the University of Nottingham.